Joshua Davis with his trophy for finishing runner-up in the Sussex Amateur Championship. A golfing talent from St Leonards produced a superb performance to finish runner-up in the 2018 Sussex Amateur Championship. Joshua Davis achieved the finest feat of his young career to date by reaching the final of the prestigious county event at Bognor Regis Golf Club last weekend. The championship began with the 65 competitors playing 36 holes of strokeplay on Friday, with the leading 16 advancing to the matchplay knockout stages over the subsequent two days. Davis led the field with an excellent five-under-par total of 135 after rounds of 68 and 67, meaning his handicap of one may well be reduced. The 18-year-old from Sedlescombe Golf Club continued that red hot form in the last 16 on Saturday morning, thrashing Zack Bacon (Littlehampton) 8&6. Davis’s quarter-final in the afternoon was much harder, but again he came out on top, edging out the Sussex county captain, Andrew Smith (Royal Ashdown Forest), 1 up. He continued his splendid run by winning 3&2 against Ashley Rees (East Sussex National) in the semi-finals on Sunday morning. The final was a close match which went all the way to the 18th before Davis narrowly lost 1 down to Tom Thurloway (Chartham Park). Finishing runner-up on his debut in the tournament - and receiving the Sussex Amateur Plate - was nonetheless a fantastic achievement for Davis, who turned plenty of heads with his consistently high quality performances. 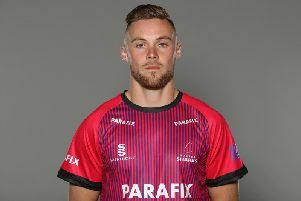 Although he has been in the Sussex junior squads since the age of 12, this result was a significant step forward for Davis, whose main aim beforehand was just to reach the knockout stages. The teenager, who has received advice from Staplecross-based touring professional Ben Evans, intends to one day turn professional. Davis is likely to compete on the amateur scene first, and is considering heading to the United States and following in the footsteps of another accomplished Sedlescombe GC player David Wicks. Davis is the current club champion at Sedlescombe GC and holder of the Paul Lawrence Scratch Plate. He has also just won the club’s winter league and plays for the men’s scratch team. The former Ark William Parker Academy pupil, who works part time in the shop at Sedlescombe GC, achieved a distinction grade in a two-year BTEC in Sport level three course at Sussex Downs College.